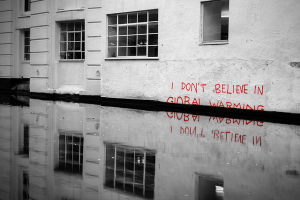 On March 15, 2019 thousands of school students took part in rallies in Sydney and across the country to protest government inaction on climate change. While applauding these rallies, Nick Deane writes that concerns about climate change and the environment cannot be separated from concerns about militarism and war. Read the article here. In response to the US led campaign to further destabilise Venezuela, an Open Letter was issued on Thursday, January 24, 2019. 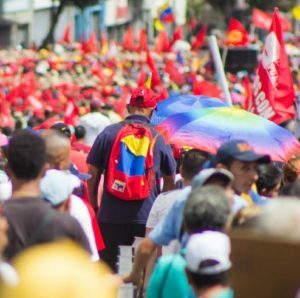 It has been signed by 70 scholars on Latin America, political science, and history as well as filmmakers, civil society leaders, and other experts. 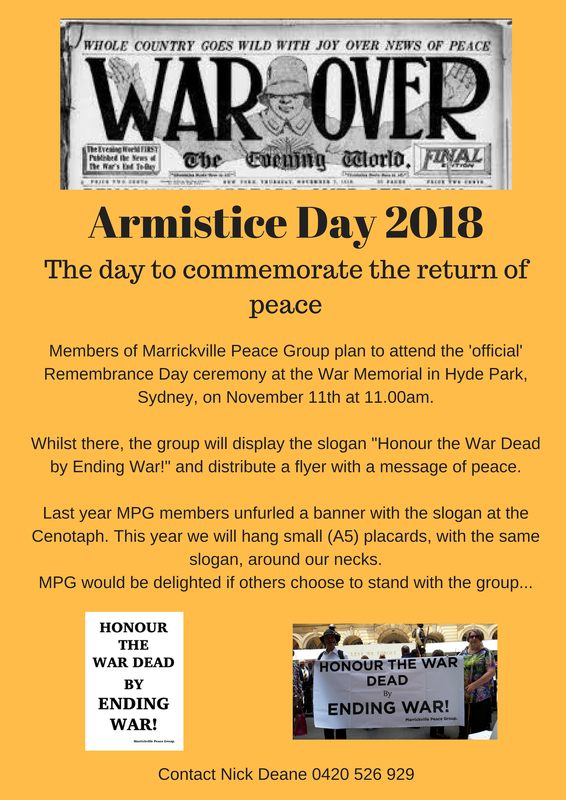 On November 11th members of Marrickville Peace Group plan to attend the ‘official’ Remembrance Day ceremony at the War Memorial in Hyde Park, Sydney. 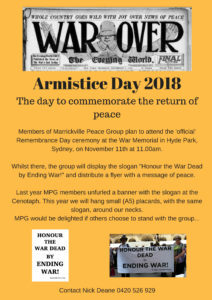 Whilst there, the group will display the slogan ‘Honour the War Dead by Ending War!’ and have a flyer with a message of peace ready for distribution. Last year MPG members unfurled a banner with the same slogan at the Cenotaph. It caused some negative response, so this year we aim to be more discrete. 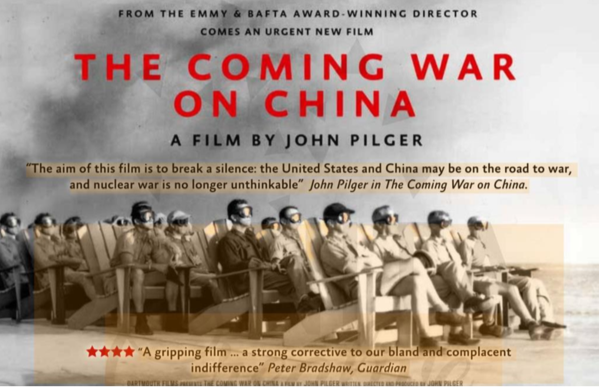 We intend hanging small (A5) placards, with the same slogan, around our necks. MPG would be delighted if others choose to stand with the group. The topic ‘Give ’em the boot! 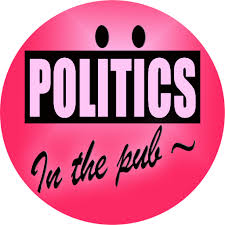 Time to close the US base in Darwin?’ was debated at Politics in the Pub on June 28, 2018. 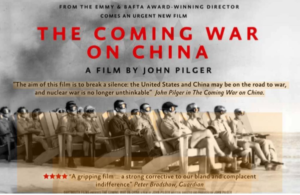 Speakers at the event included Nick Deane (Give ’em the Boot Campaign) and Dr Andrew Mack (Lecturer in Political Economy of East Asia at the Boston University Sydney Academic Centre). YouTube videos of their presentations can be accessed here and here. 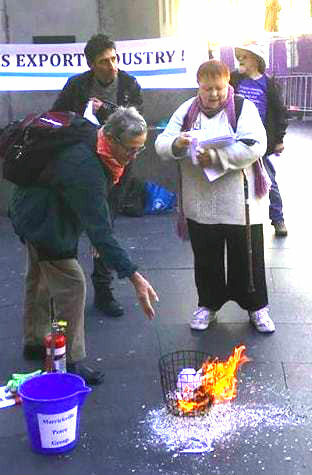 A public rally to symbolically destroy the Australian Military Sales Catalogue took place on June 30, outside the Queen Victoria Building. A small (and safe) fire was started for this purpose and the catalogue was destroyed page by page. The catalogue is published by the Coalition government for the purpose of promoting the sale of Australian-made military equipment and weapons to other nations. Minister for Defence Industry, Christopher Pyne MP, has expressed the ambition of Australia joining the ‘Top Ten’ global armaments suppliers. View the YouTube video of the event here. Read more about the opposition to the Coalition government’s new global defence strategy here.